Sou | 8:16 PM Feel free to comment! Anthony, I believe you'll find, should you ask him, that Dr Romm knows that the bryophyte was not frozen in ice before it was frozen. I wouldn't mind betting that there might even be one or two of Anthony's Dismissives who would twig to that. Clever little Anthony is correct when he writes that the bryophytes emerged after the end of the Little Ice Age ended. They emerged about 160 years after it ended. This past hundred years marks the first period ever in the history of Earth that any species has had the power to choose whether to end the world as we know it or whether to limit the damage being wreaked upon life on earth. It's probably the first major mass extinction event since the Cretaceous–Paleogene (K–Pg) extinction event, which took place about 66 million years ago. It would be the first time in the history of earth that a sentient species knowingly and willingly charged full pelt towards its own destruction, if Anthony Watts had his way. Who's won the Battle of the Brains? Hands up everyone who thinks Anthony Watts has it all over his scientific dog, Kenji and Dr Joe Romm when it comes to intellect. Now to the unfrozen bryophytes. Here again is a link to the abstract in PNAS1. Below is a repost from The Conversation. Retreating glaciers are proving to be good news for plant scientists. Underneath one such glacier on Ellesmere Island in Canada, researchers have found plants they believe have regrown after being entombed in the glacier for more than 400 years, since a cold period called the Little Ice Age. These plants are called bryophyte, a group that includes mosses. They are non-vascular, which means they do not have tissue that distributes resources throughout the plant and they do not reproduce through flowers and seeds. They use spores instead. But they also possess the ability to regrow from tiny fragments of themselves through a process called clonal growth. “This ability makes bryophytes pretty tough,” Andrew Fleming, a plant scientist who was not involved in the study, said. The discovery reported in the journal Proceedings of the National Academy of Sciences was made by a team led by Catherine La Farge, an expert on bryophytes at the University of Alberta. Because the bryophytes found were not much different from similar variety found in the wild today, La Farge used radio carbon dating to confirm the age of their find. The plants were trapped during a period known as the Little Ice Age, between the 16th and 19th centuries, when glaciers were growing in size. Arctic glaciers have recently been retreating and, since 2004, the rate of ice melt has increased dramatically. La Farge is hopeful that, in addition to these plants, the melting glaciers will release other interesting flora and fauna of that time. When these bryophytes were found they were blackened, but sported a hint of green. 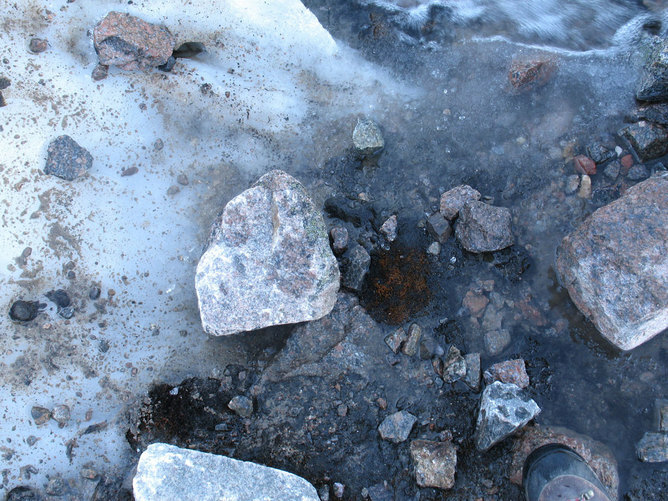 This discovery does not displace the record of the oldest frozen plant to be regenerated. That belongs to a 32,000 year old specimen of Silene stenophylla, which was regrown by using tissue extracted from its frozen seeds. These bryophytes are also not the hardiest plants we know. That title belongs to what are commonly known as resurrection plants, which are able to survive extreme dehydration. Some of these are commonly found in deserts, such as Selaginella lepidophylla found in Chihuahuan Desert on the border of Mexico and the US.